Ho Ho Ho! Christmas Cheer From Germany! Guten tag from a cold and festive Germany! I’m on a train from Frankfurt to the quaint Bavarian village of Rothenburg as I pen this. Outside, the landscape is a stark contrast between bare brown forests and colorful countryside homes. It’s symbolic of winter in Europe; introspective and festive at the same time. Dressed in my polar bear costume (our pilot described the negative one degree temperature as “warm” when we landed! ), I hit the Christmas Market in Frankfurt last night, together with two bloggers from Korea and China. Colorful booths lined the streets, selling traditional German and Christmas gifts. Food stalls served up hash-browns, frankfurters, crepes, and local delicacies. Kids played on brightly lit merry-go-rounds and the whole place had a carnival-like feel. People gathered around drinking glühwein, the famous warm mulled wine of Europe, chatting, warming up over some neighborhood gossip. Christmas music played everywhere, and the night rang with the clinking of cups and prost. Such revelry! Festivities at the Frankfurt Christmas Market. This is how people keep warm on cold winter nights in Germany! Traditional miniature christmas gifts for sale. I joined in the festivities, warmed up over a cup of glühwein, and chatted up friendly local women who’ve been coming to sell traditional gifts at these markets since they were little girls. Then like I promised on Facebook and Twitter, I found a perfect Christmas gift for you! The famous German Räuchermännchen has come all the way from east Germany, and though it looks like a wooden toy, it is actually an incense smoker! You open the lower half, put in a burning incense, and let it keep you warm and smelling like Christmas on a cold winter night. Say hello to the Räuchermännchen! I’ll buy a Christmas gift every day from different markets in Germany. You can enter the Christmas Hunt in Cool Germany contest every day to win it, and also win a flight ticket to Germany on Lufthansa Airlines! Have you been to Christmas markets in Germany? What do you love most about them? Join my adventures and gift hunt in Germany on Facebook, Twitter and Instagram! Note: I’m travelling in Germany on invitation from Lufthansa Airlines and Germany Tourism. 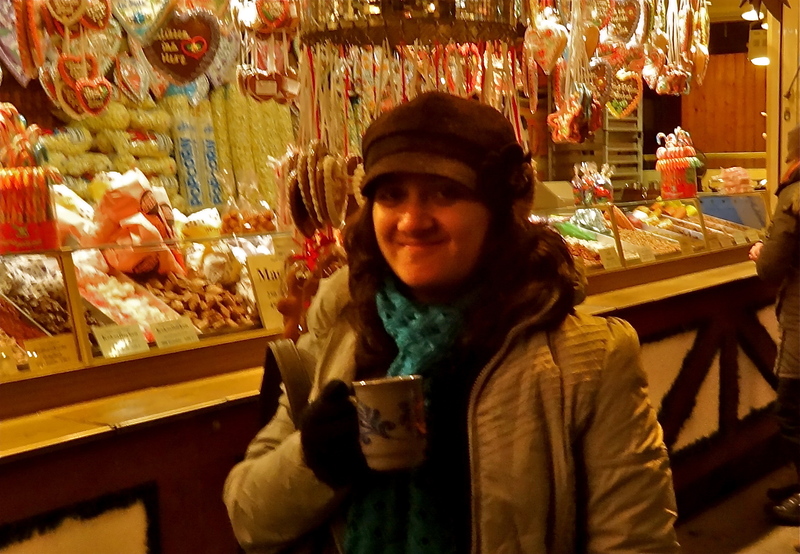 Your Christmas Market pictures are perfect and bring back memories from four lovely years of working in Frankfurt. I recall so many German residence windows displaying three things in the cold, dark winters: dainty white lace curtains, a candle and a pot of very colorful cyclamen flowers. That sounds beautiful! I didn’t have much time to wander around the residential areas of Frankfurt, but glad my pictures could bring back some memories. Frankfurt must’ve been a nice place to live? Loved this place when I visited it alongwith friends in 1994. Don’t forget to check out the “Medieval Crime Museum”… gruesomely fascinating! Wow, I wonder how it’s changed in the 20 years since! Are the photos any indication? I hope so, and hope it’s soon Kaushal! so glad you like the German Christmas Markets so far! And the Räuchermänchen is very cute. Love them. But don’t drink too much of Glühwein. Try instead “Feuerzangenbowle” – a special mulled wine with fruits and caramelized sugar and Rum. Very tasty! Have fun my friend! Hope to see you soon again in Germany – but with warmer temperatures. Thanks Romy. Took your advice and tried some Feuerzangenbowle 🙂 A little strong but great for the cold for sure! I landed back in India this morning and already miss the festivities. Hope to come back soon and see you in Hamburg next time! I love how colorful and vibrant the Christmas markets appear. Such a nice post. Thanks. Thank you for bringing Germany’s Christmas spirit for us! Enjoyed reading your experiences. Looking forward to more! Christmas market in Frankfurt looks so colourful and you are tempting many of us with your pictures and posts, looking forward to more and more and more….. It sure was, KG! And that was just the start, the markets of Cologne and Berlin, which you can see in my next blog post were even more festive. Hope you get to visit them soon! Another great post…. looking forward to reading more about Germany in the winters! Never been to the Christmas markets in Germany though I’ve heard about them from friends. Would love to visit some day and see all the hand crafted ornaments and gifts. Must be difficult to decide what to buy. What a treat! Looks lovely! I went to Berlin earlier this year and loved it and every year I say I should go to the Christmas markets. Definitely putting it on my list for 2014! Previous PostWhat Seychelles’ Most Famous Musician Taught Me About Dreams. Next PostIn Photos: German Christmas Markets.